Why does Recart only send one Shipping Notification? Recart only sends one Shipping Notification, the Fulfillment Notification. Find out why we didn't build the last two. We always look for the best way to invest our time & energy in our product. It's always challenging to build features that will bring a huge uplift for you. It's all about generating more revenue for your store. However, in the past, we built some fancy features what didn't make so much money for stores. We swore: we won't make that mistake again. We faced a similar challenge a few weeks ago, so I'd love to talk about it. 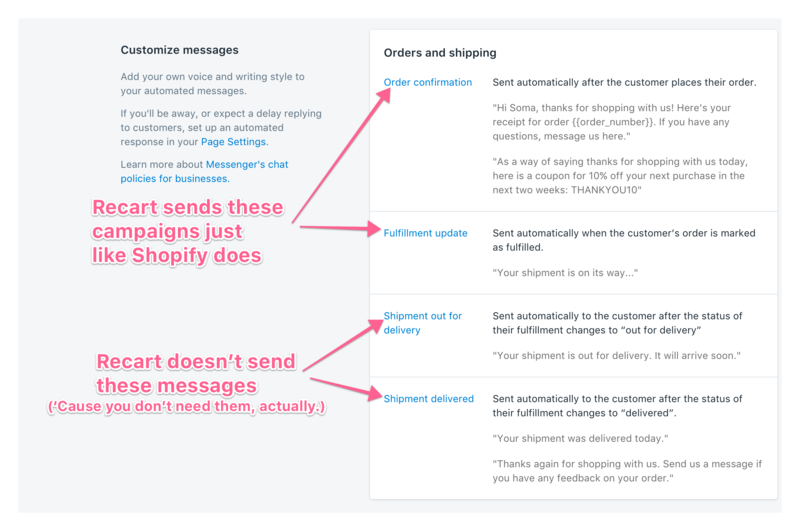 Shopify's Messenger notifications can send up to 3 shipping notifications. At Recart, we decided to build only one, the Fulfillment Notification. As always, we did an extensive research before we started building the campaigns. We followed our Shopify users' webhooks (fulfilled, out for delivery, delivered) for two weeks. 2 out of the 3 webhooks seemed almost completely unused in the Shopify: the 'out for delivery' and the 'delivered'. We went ahead and found that these messages are triggered by the 3rd party shipping carriers. These webhooks stay silent for almost all of the time. We monitored more than 5,000 Shopify stores and only found only a few 'delivered' webhooks. Fulfillment webhooks are more reliable because they are triggered by Shopify directly. So we decided to ditch the Shipment out for delivery and the Shipment delivered campaigns. For avoiding the confusion, we skipped these campaigns. The Shipment out for delivery and the Shipment delivered campaigns can seem useful and fancy. I truly believe that if the shipping carriers would send back the proper webhooks it would be useful for you. But they don't do it right now. We'll keep monitoring these webhooks. If we see any changes in the future, we'll add the missing campaigns automatically. Learn more about our Fulfillment Messenger Notification. As always - if you have any questions, don't hesitate to contact us on the support chat!